Lord: it is time. The summer was stupendous. and let the wind blow on the meadows! Who has no house now, will not build. to and fro, while the leaves are blowing. I’ve spent a few hours this month practising this Haydn piano sonata. It’s really taken me back. I remember my mother practising it when I was about ten or eleven. I only thought about this when I started working on it but I think the fact that she played the piano a lot had a lot to do with me growing up with a passion for classical music. It’s obvious, really. I, her captive audience, heard her favourite pieces played often and got to know them. This was music without lyrics (although there was that, too, mostly from the National Songbook), music made of memorable ideas rather than melodies. It is a commonplace to say of literacy, that if you want your children to enjoy reading books, enjoy reading books with them. If my experience of childhood is anything to go on, then, the same thing goes for music. When I mention to people that I’m a musician they often tell me that they “used to play” the clarinet, the violin or whatever. (I sympathize: I made very little music for over a decade. Other things seemed more important). Others tell me they would “like to” learn an instrument. If all those people got learning or dusted down their old instruments and got playing them again (at whatever level) they would be doing the next generation a great favour. Just as with reading books, if making music is something adults make time for and do, it’s something children will want to do too. If you invent anything you never know where it will end. It could be anything from some all-consuming masterwork to nothing more than whistling a tune you don’t remember anyone whistling before. Images, texts, pieces of music percolate through culture and history in the most amazing ways. It must be one of the great joys of creativity. Did Leonardo know what Marcel Duchamp surmised? Could Shakespeare guess that the Montagues and Capulets would morph into the Jets and the Sharks? 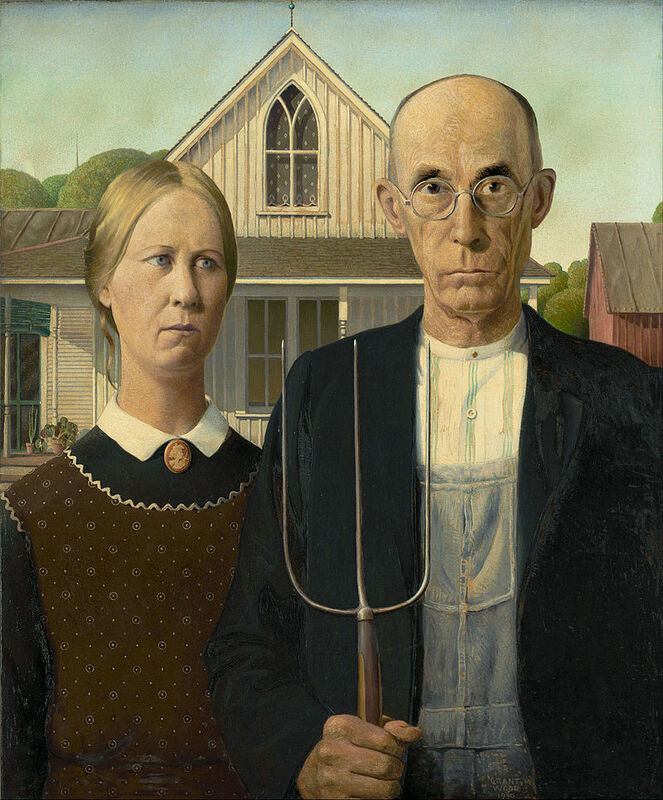 Grant Wood could never have known his painting would “go viral”. And could his sister and dentist (yes, his dentist, apparently) have had any idea what they were letting themselves in for? Thanks are due to the Poet in Residence for inspiring this post. Looking through my blog’s admin pages I see that I’ve written several posts in the last few months – but always left them unpublished. Reading through them, I can see why I was unhappy with each one – but I’m curious as to how this state of affairs has come about. I’m reminded of a condition said to affect darts players. You pick up a dart, aim it at the board, you flick your wrist but, when the moment comes to let go your fingers just won’t do it. Another reason for the inactivity is that I’ve simply spent time doing other things, one of the more pleasant of which has been reading more books. Two stand out in my mind: Robert Macfarlane’s Landmarks and Roger Deakin’s Wildwood. I’m not sure what to make of “new nature writing”. Part of me shrugs, and thinks, aren’t these just books that might otherwise have been slightly anodyne (if environmentally edgy) TV documentaries? Am I just reading about humankind tearing the planet apart the way, when I was a kid, one could turn on BBC2 and watch lions tearing up wildebeest? Entertainment with it’s consciousness raised is still just entertainment. Another part of me is drawn in, impressed by writing that makes anyone who reads it more aware of the world around them. Who can fail to be disturbed, for example, by Robert Macfarlane’s comparison (in Landmarks) of Victorian London’s edgelands with their plethora of wildlife with the situation nearly two hundred years later? He quotes the Victorian nature-writer Richard Jeffries, who paints a picture of a world burgeoning with wildflowers, birds and animals that seems chillingly unfamiliar to anyone living in similar settings today. I found myself thinking of this passage when I went for a walk over the hill in front of our house yesterday with my daughter. You get a great view over the dale from there. I found myself, as a thought experiment, making an imaginary film of that view that started 10,000 years ago and which ran right up to the present day. If the film could be speeded up to last, say, two minutes, would the final frame seem quite so idyllic as it looked as we stood there? Or would it appear as a wasted shadow of what it once was? a brown line winds across the field. but, when I walk it, I rarely meet anyone.